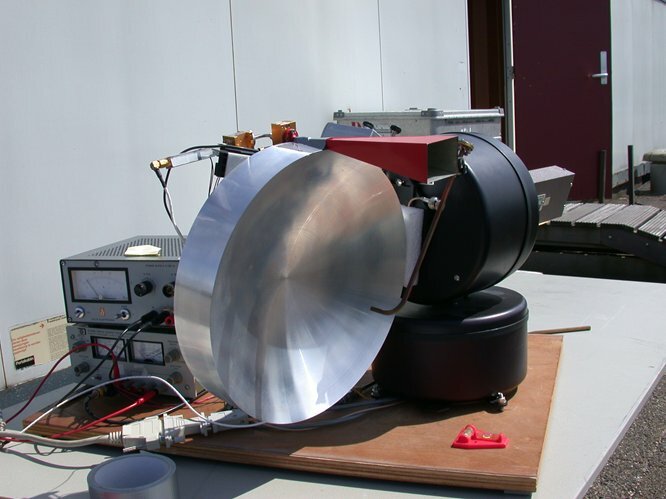 TNO’s Microwave Department developed and experimented with a millimetre wave (92-96 GHz) radiometer between 1982 and 1989. 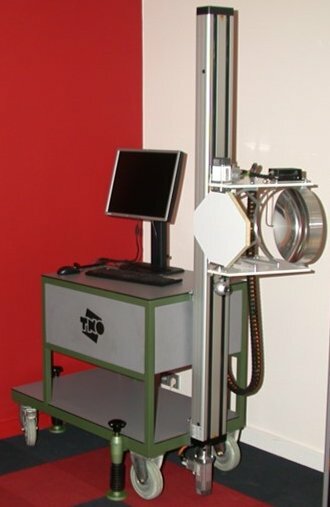 This radiometer measures the RF emission of objects. The normal human body temperature is 37 C or 310 K. Without any other resource, such a body cannot be seen in the visible light spectrum. However, a body can be made visible in the infrared spectrum as well as in the millimetre spectrum. 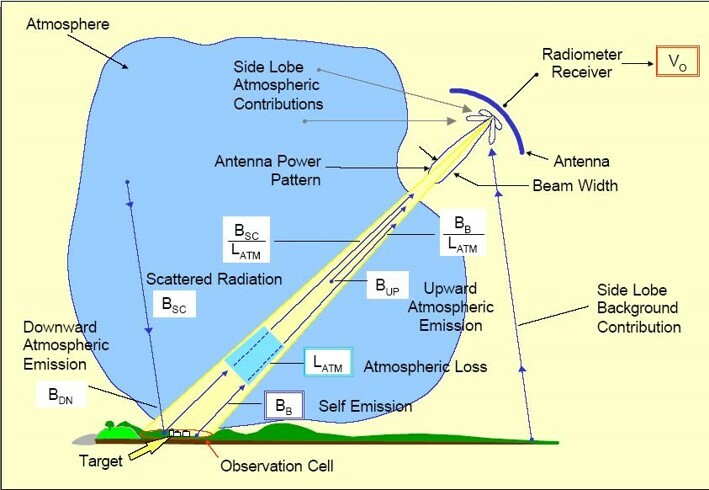 However, the amount of such radio-frequency (RF) emission is a factor of 10,000 lower than the infrared emission. On the other hand, smoke, dust, textiles, wooden doors or plastics are virtually transparent for mm waves, something which is not the case for infrared. 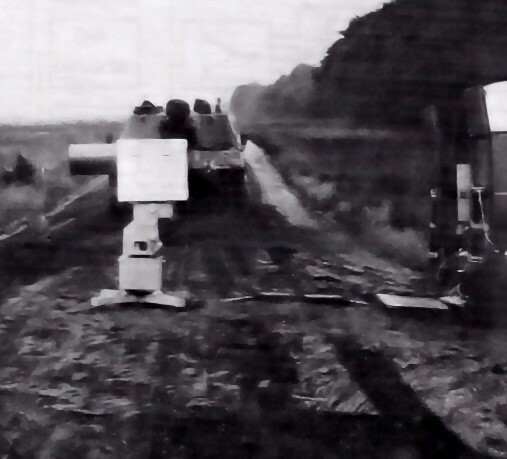 With the 1989 radiometer, it was possible to recognise a vehicle in dense fog at a distance of 100 metres. 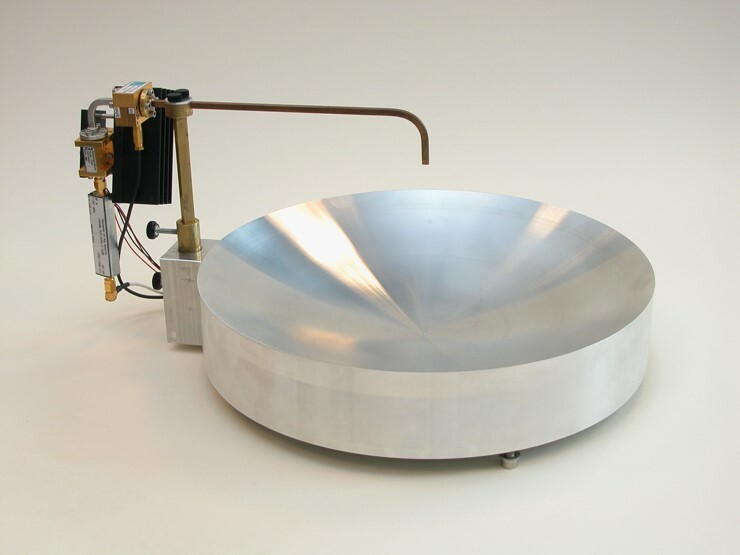 The development of millimetre wave components was still in its infancy. Very long integration times (1-10 seconds per measured point) were required. A 2D-photo of a vehicle took more than a quarter of an hour. It took until 2003 before the old radiometer was retrieved again from the basement and equipped with more modern components. The resolution, dynamic range and measuring speed were greatly improved. The application was mine detection (see mine testbed). 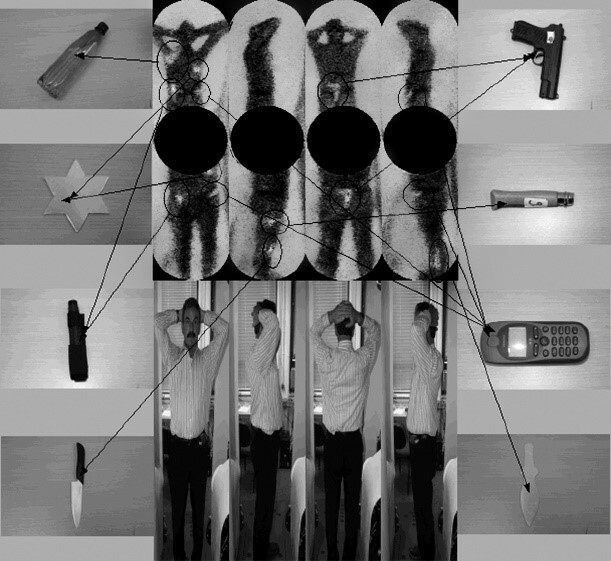 In 2004, TNO was asked to develop an instrument for hidden weapon detection, a so-called body scanner. To be able to detect such concealed weapons and other contraband, use can be made of active or passive detection. 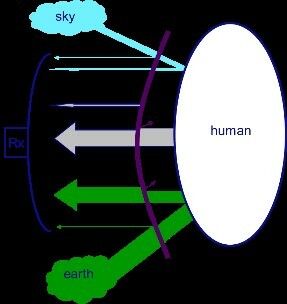 In the first case, the person is irradiated with RF energy (‘radar’). 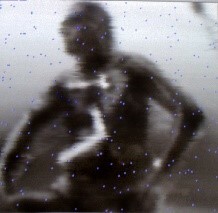 The reflected waves are then detected and processed. 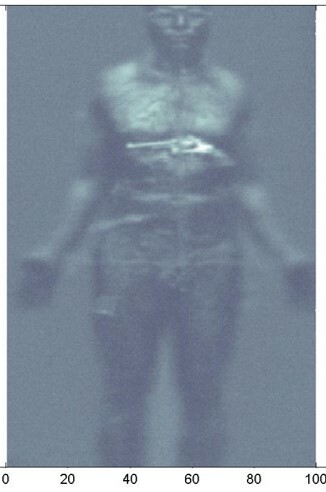 TNO’s client, however, opted for passive detection using waves with a wavelength of 3 mm generated by the human body itself as a reflection of natural background radiation. The largest emission contribution comes from the body and from the environment, a small contribution comes from clothing. By focussing the received energy, it is possible to measure the emission of a small part of the body. 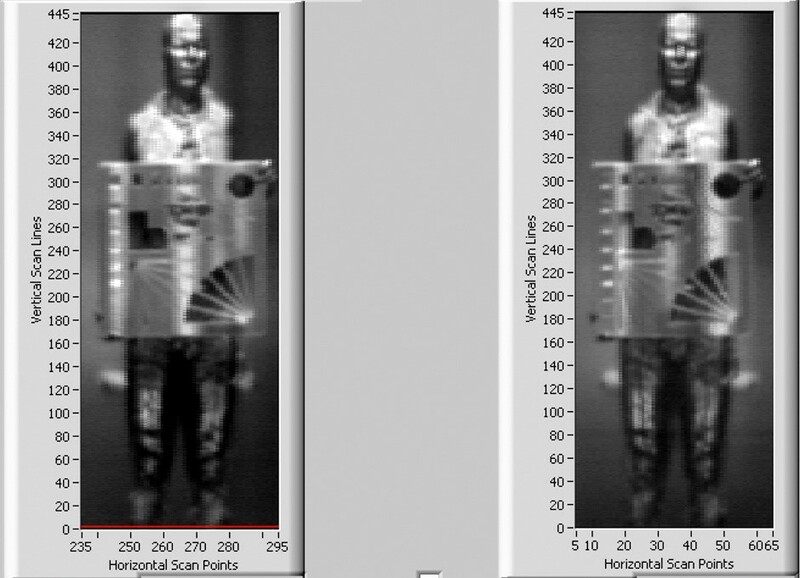 In 2005, a second version of the body scanner was developed with a fast rotating flat mirror. That mirror reflects the collected radiation onto a concave mirror. 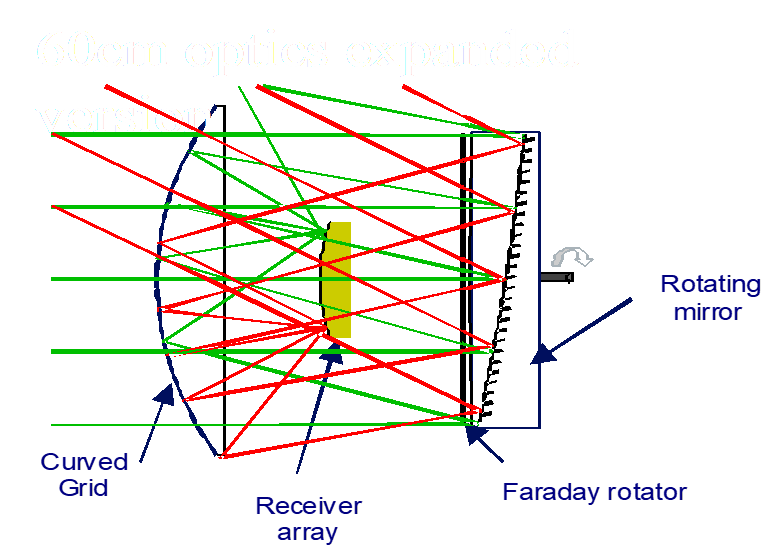 The concave mirror concentrates the received energy at the focal point where the received energy is picked up by a receiver and leads to a signal that can be processed. This mirror construction as a whole moves vertically from high to low in front of the person. Smart processing of the received signals leads to an image. The instrument quickly became a popular object for demonstrations and TV recordings. 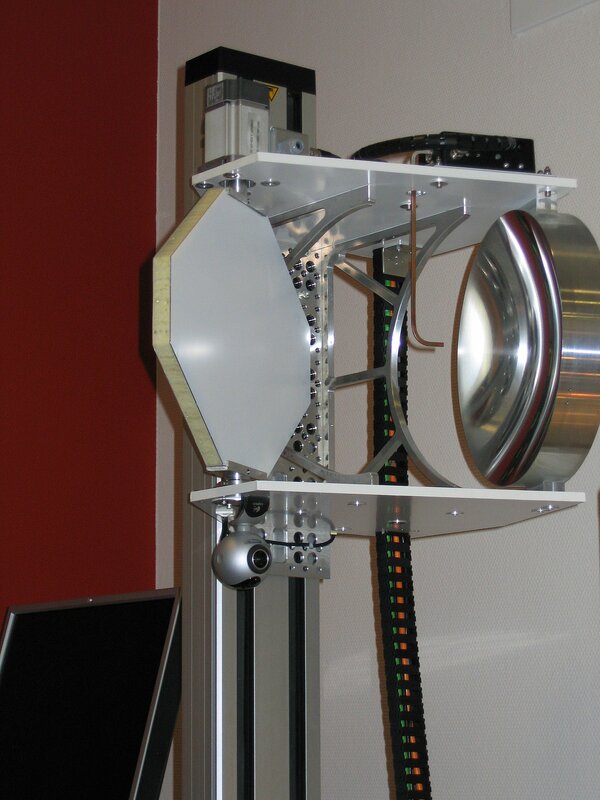 In 2007, an indoor hidden arms detection tourniquet was commissioned by an English company. The total recording time with four cooperating radiometers was five seconds. The results were sufficient. An ethical aspect emerged. In order not to show the detailed ‘naked’ images directly to the security guards, it was necessary to carry out post-processing which only shows the location of hidden objects in relation to the height and width of a standard person model. 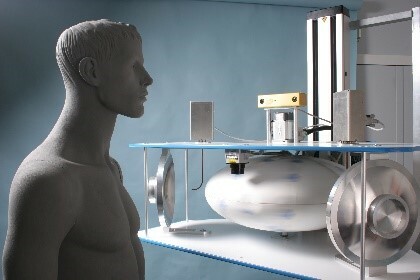 Indoor bodyscan tourniquet with four simultaneously operating radiometers. All test weapons and objects were located. Despite the demonstrated good functioning of the passive detection system, active body scan systems are now installed at airports. In 2009, the second version of the body scanner was equipped with a second receiver. This allowed stereoscopic images with a focal distance of 85 cm to be made. As a result, the scanner could be used for biometric facial recognition. With the experimental system, 49 of the 50 camouflaged test subjects could be identified. Trick: look closely at this stereoplate. Then look squint so that a third photo is created in the middle of both photos. In this middle ‘photo’ you see the depth and the image becomes sharper! With a little practice, you can hold the ‘3D’ image even if you move your head back and forth. 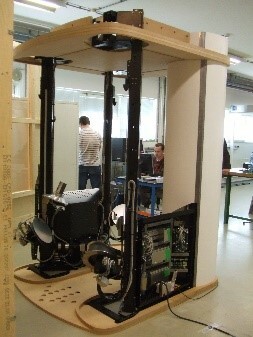 This latest experimental stereometric body scanning system is still working in the museum.